My office is piled high with books. Kind of unexpected for a woman who can't get through a single day of work without her delicious tags, RSS feeds and twitter archives. I get inspired online, but that's never slowed my appetite for books. Industry books, fiction books, culture books. I like the ones that go deep on how to think about an idea, that give a clear and fresh perspective. The Next Evolution of Marketing. This one was the reason I started this post. I've followed author Bob Gilbreath for years. He's the wicked smart chief strategist at Bridge Worldwide and he's written the MarketingWithMeaning.com blog since its inception. Bob looks at how break-through brands are connecting with today's sophisticated customers. What he finds is that to really make an impact, the marketing itself has to add value to our lives. The case studies are all entirely repeatable (after all, why buy a business book if you can't quote it later and sound brilliant in a meeting??) and the insights are, well, meaningful. Get a free chapter: I got a note from Amanda Hill asking that I pass on word that you can download a free chapter to preview the book today. They'll even make a donation to a good cause (ok, the cause is making more advertisers, but still) if you do. Get yours. This skinny volume by Jonathan Cahill is full of ideas that worked. Quick sketches of marketing strategies that paid off big for large and small companies the world over. Clay Shirky is a natural storyteller. His enthusiasm and curiosity come through in every story about how technology is changing our culture. The examples go deep on how our expectations are evolving and how that's changing the way we see the world - from where we spend our time to who we trust to what we shop for. Tara Hunt makes one of my favorite arguments brilliantly - that the currency of the social web isn't revenue, it's reputation. Her native look at how people and brands use it concentrates on the basics of how to socialize your brand: authenticity, listening, engaging, and trusting. Social media has changed no industry more than public relations. The last few years have represented nothing short of a revolution of the model. Brian Solis takes a thoughtful approach to what public relations means now, with lots of real-world examples on where communication and expectations are going. I'm excited to end this 'Advice for Newbies' week with a post for young women featuring an interview with Nina DiSesa, Chairman of McCann Erickson New York and Ale Lariu, "mother superior" of SheSays. Last month, Ale, Associate Creative Director at AKQA NY (in addition to the whole mother superior bit), reached out to me about an event sponsored by SheSays in New York. Ale explains the big idea behind SheSays this way: "The world is pretty much half men, half women. So why are there hardly any women in the creative department of most digital ad agencies? We decided to stop chatting about it and do something - like hold events where top women in the industry share their thoughts and help people to either get started or work their way up." 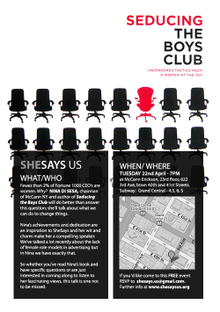 Last month, the event was keynoted by the enviable Nina DiSeso, a hands-on creative leader who worked her way up to the very top of "Madison Avenue" and just published a great book called Seducing the Boys Club. The book is at once mentorship (on success and management) and the story of life lived in an ad agency. Nina has taken what she's learned from male behavior and her own missteps to create a guidebook for getting ahead. If you're just getting started, it's truly a sneak peek into every interaction you'll have for the next 40 years. Q: Even at this stage in my career, I've been in plenty of meetings where I'm the only woman in the room. I've been thanked for the refreshments and complimented on my shoes, but, generally still end up with the respect and the attention of the room by the end. Do you have any tips for people just starting out on how to win respect / attention in tough environments? Nina: It’s always best to be needed and essential for something. Not for serving coffee or doing “women’s work” but needed in an indispensable way. This can be accomplished at any level. 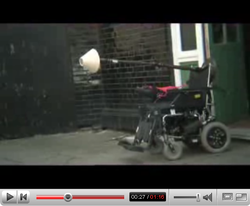 If you read the story about Harold in chapter seven of the book you will get a good idea of what I’m talking about. There are a lot of ways to get clout in an organization, find the ones that work for you. 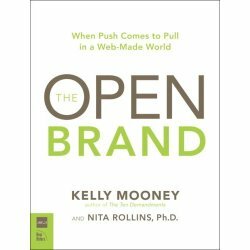 Q: Writing a book like this and even speaking at SheSays seems very controversial for a women exec. Particularly one at an ad agency. How did you decide to go for it? Nina: Actually, I was hoping I’d be retired by now, but it doesn’t look likely, at least for another year or two. It wasn’t much of a risk. My mission is to reach out to women of all ages and help them get in control of their lives, their careers and their own happiness. But this also applies to anyone who finds herself or himself in an environment where they are different from the majority and are having a tough time making progress to the top. McCann Erickson has been behind this from the start and they are proud of the book and me. Q: How have your colleagues and clients responded? Nina: With delight. Although the clients always want to sit next to me now so they can see how I am trying to “seduce and manipulate” them. Q: What are your #1 pieces of "do" advice and "don't" advice for young women working in agencies that could fairly be called "boys' clubs"? Nina: Well I wrote a whole book about this but to bring it down to the simplest terms: “do” whatever it takes to win, “don’t” resent the men or anyone else who appears to be unsupportive – learn from them. And always remember the most powerful question in the English language: “What’s in it for me?” This doesn’t mean what’s in it for YOU; it means you have to find a compelling tactic for the person who you want to influence. You want something from someone – what’s in it for them to help you? Q: In Seducing the Boys Club, you talk about "How Men Listen." I love the part of the story where the two embattled ad guys bemoan your feedback with "That's the trouble with this agency..." Have you found any great ways to create more positive environments? Or, at least quell the "this agency sux" happy hours? Nina: I have never tried to stop the whining and complaining of the creative people. They have to vent and it’s a natural part of the creative process when someone kills their “babies.” We all do it. We get angry, we vent, we believe the person who killed our work is a hack and doesn’t know a great idea from a lousy one, then we get over it and do something so much better it even shocks us. As long as better work develops from this process I don’t mind it and they always forgive the creative director who forced them to dig deeper and get better work. Creative people complain. It’s part of our nature. Allowing us to this and having a sense of humor about it is what makes for a more positive environment, strangely enough. Also winning helps. When we sell good work and win the respect of our peers it makes us happy. It’s a fleeting happiness, but it still feels good. Q: Can I say - you look gorgeous? The stress doesn't seem to have gotten to you. Do you have any great tips for maintaining perspective? Nina: Thank you for the compliment. Actually, I do look younger since I handed over the New York creative director responsibilities to Joyce King Thomas and she thinks that she’s starting to look older. (She’s not.) Once on the elevator she announced that she could actually see the stress traveling down my body, slithering across the floor, then climbing up her own body until it lands on her face. Stress does age us but the good news is that when the stress lessens our muscles relax and we look better. At least that’s what I think. You happened to catch me at an unstressed moment. Up until a month ago I was very stressed out and it showed. Q: How did you get involved with SheSays? And, do you think it's a good idea for young women to join women peer groups in the workplace? Nina: I was introduced to the group by Alessandra Lariu, who I met at McCann (we were trying to hire her, I believe). I was so captivated by her I decided to speak to her group. I do think it’s a good idea for women of all ages to join up because we often feel so isolated and it’s good to know that we are not alone. Also, women are bright and when we relax we can also be a lot of fun. This isn’t a bad characteristic to develop. Q: What is your best advice for women starting out in the industry? Q: What about women in career transition? Ale: I'd say the same thing as above. And perhaps you might need to take a pay cut but it's all about the bigger picture, your goals and where you want to be. It might be hard in the beginning but the experience in another career will help accelerate the race. Q: What do you wish you knew when you were a rookie? Q: What's next for SheSays? Ale: In the UK we've started to run free presentation courses. In the US, we'll continue free monthly meetings showcasing amazing women in digital/advertising. We'll also set up our mentorship program called 'Who's your momma'. Last words: Don't forget to order the book. Groundswell. A book about a movement. I almost don't want to tell you about this book. I laughed. I dog-eared a ridiculous number of pages. I found cause to clamor for a notebook to jot, nay, furiously scribble down an idea. I'm already retelling the stories. It's almost too good to share. In general, I think good marketers come from two basic camps. Statistics and experience. Or, how we can model and measure likely success vs. how we can learn from what's worked and hasn't worked in the past. Heady or intuitive. 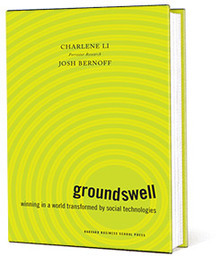 Groundswell author's Charlene Li and Josh Bernoff are from Forrester Research. So, it was no surprise that they could write analytics well. Could lay out an infinitely logical and actionable model for how to do social media with your customer audience. What was a surprise is what amazing storytellers they are and how willing they were to bluntly - sometimes harshly - tell it like it is. Li and Bernoff start of by setting aside particular technologies and diving deep into the ways social media has changed us. Increasingly, they argue, we get what we need (news, reviews, shopping, etc.) from other people rather than from traditional institutions (like business or media). Why do people spend their time on this? How is this going to impact - threaten / totally screw up / help - my business? But, the best part is the back 2/3s of the book where Li and Bernoff dig into various strategies to tap into the groundswell with stories about the success and failure of brands brave enough to give it a try. And some reveal surprising results. Like how Blendtec's funny 'will it blend' videos (crunching up iPods and other odd things) popped sales of the absurdly expensive kitchen device 20%. Or just how much of Ernst & Young's recruiting is powered by Facebook. And some were simply inspiring. Like the oft-told story of Best Buy's Blue Shirt Nation (btw - next time I talk about my home agency, let's remember - it's not self serving, I'm just an Orange Shirt) or the all-too-human ways execs at Avenue A / Razorfish connect with employees. Every story is accompanied by the business plan behind it. Why it worked. What the ROI was. How to know if it's right for your audience. You can probably guess which parts I dog-eared. Love of a boy or girl who you must be near. Or longing for the kind of place you experienced briefly once -- maybe you went to school here or had family here or even grew up here and later moved away. 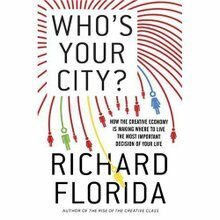 I was wandering around Barnes and Noble this weekend, kind of spinning my wheels waiting for adver-boyfriend to sate his periodicals addiction when I came across Who's Your City by Richard Florida. Florida's aim is largely to defend the importance of a sense of place vs. the encroaching genericism of globalization. Where you live does matter and is part of who you are. It took me back to the very logical approach I took to relocating from Chicago to -- it turns out -- Columbus. Books with city ratings were purchased. Web sites were bookmarked. Conversations with employers were had. And, none of it even got close to telling me how happy I'd be here. Florida has a list of his own. The top cities by various lifestage criteria. Columbus doesn't make his list. (Although it made a ton of others). How do you like the place you're living now? I love living here. Surrounded by smart creative people, great neighborhoods and a really progressive culture. Columbus is one of those places that draws you to it. It's got the personality of that one guy who everyone likes -- who is kind of a mellow cool, is ok with just about any kind of person or lifestyle, and is comfortable having a beer on the patio or out at a gourmet dinner (well, as long as he can wear jeans with his jacket). Is it somewhere you really want to be? Yes, I could live anywhere. And, have lived in Chicago, Pittsburgh and small-town Appalachia. I actively choose to live here. Does it give you energy? When you walk out onto the street, or the country lane, in the morning, does it fill you with inspiration, or stress? It absolutely gives me energy. And, when I'm out walking the dogs on the cobblestoned streets of my historic neighborhood or shopping in the sophisticated Short North, I'm almost guaranteed to be smiling. Does it allow you to be the person you really want to be? Are you achieving your personal goals? I feel like I can achieve all my personal goals here -- the affordable cost of living and healthy economy are an ideal foundation for a professional life. And, the generally accepting vibe makes any lifestyle comfortable. Is it a place you would recommend to your relatives and friends? I've been trying to get my sister to move here for years. Short story: Columbus is the best place for me. And, for the creative class. They just don't all know it yet. Check us out for Volume 2, Richard. What I love about business books is the anecdotes. The collections of a gratis illustrations from women who’ve been running the room for 20 years. The totally repeatable, wow I didn’t know that’s how they came up with that ideas. The insiders guides to the coolest trivia your industry has to offer. Good business books are - quite simply - repeatable. And, particularly if you're new(er) to your career, can help you learn how to speak the shared language of industry and cultural metaphor. 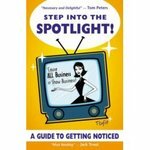 So, I’ve enjoyed flipping through Tsufit's new book: Step into the Spotlight. It’s not exactly the kind of book you would sit down and read cover-to-cover, but more one that you keep handy for right after a painful conference call or one of those incredibly long networking events that seem to stretch as long as an average week. A quick flip will lead you to a little perspective, a fun anecdote or an exercise in figuring out, well, you. And, all written in the chatty, playful voice of a woman who divides her career among executive coaching, book writing and stand-up comedy. It’s incredibly reminiscent of what Sark did for everyday creativity. Her scribbly journals and stream-of-consciousness creative guides at once elevate playfulness and introspection, seeking to loose a little wild creativity. Tsufit may be a bit more buttoned up, but you can quickly see that her message isn’t the words on the page, it’s what she wants to inspire in her reader. A little confident, sassy business savvy that feels like you found it yourself. The media room for Andy Beal's Radically Transparent offers enough content to power six news articles, four custom reviews, a buying decision and an ongoing relationship. All in one place. All super easy to navigate. AKQA and Cake really fundamentally get it. It being social media and brands. You have to be able to take liberties - with yourself, your culture and your customers. You have to be able to delight and entertain and be completely different than a 30 second spot. Little escapes the snark of this video from Pot Noodle. A piece that 200,000 people have already watched this month. When Molly posted this video on Twitter, I had to ask her if it was sanctioned or organic ... the very simple delivery is so brimming with personality and conversation that I couldn't imagine it making it through any agency's self-marketing process. And, the simplicity of it - from an agency that COULD do anything - might just make it even more compelling. Speaking of Twitter, I've been logged on for the past two days reading some of your favorite bloggers cover Ad Age's Digital Marketing summit in real time. The posts include verbatims, analysis and a little argument. It's addictive. After it sat for months on my teetering bedside stack of good intentions, I've finally picked up RenGen and dug in. 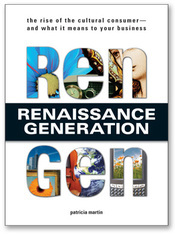 Definitely my favorite industry book of this year... as much for its optimism as its smarts and illustrative examples. Martin connects the dots from our creative and intellectual selves to a theory of renaissance that will define a generation. For every thoughtful discussion I've had about the cultural consumer, the green citizen, the attention economy, I've had a party / conversation / meeting completely derailed by a group of mainstream 30-somethings playing or talking-about-playing video games. Even as I type this, my copy of RenGen is sitting under my PS3 controller on the coffee table. We - the fabled, if aging GenXers - are a damn playful bunch. Our marathons are as likely to be a Saturday of Project Runway reruns as 20-sweaty miles across the city. We've passed on scrapbooks for passing around digital cameras packed with thousands of hammed-up snaps. We can cook but would rather collect memories of childhood munchies - from an EasyBake oven to the Snoopy Sno Cone machine complete with grape syrup. Anyway, I’m happily in the 25%. In fact, my magazines and even nonfiction books quickly become a choose-your-own-adventure, notes-all-over-the-index, dog-eared mess. So, true to form, when I picked up Mark Tungate’s new ad history book, I flipped right to the chapter on Chicago, then to Consolidation Incorporated (did you know: ‘Almost everyone in advertising works for one of five different companies’) and onto Dotcom Boom and Bust before even flipping through the index. I mention all of this because: I really recommend this book. As always, it’s more difficult to write short than long, but, yeah – here-here, Sir.